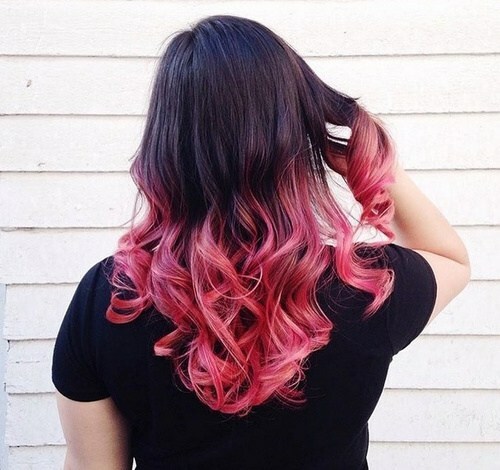 Pink to make the boys wink – or so the saying goes, but with this collection of gorgeous pink ombre hair looks, we’re pretty sure everyone will be winking in awe of these beautiful cuts! 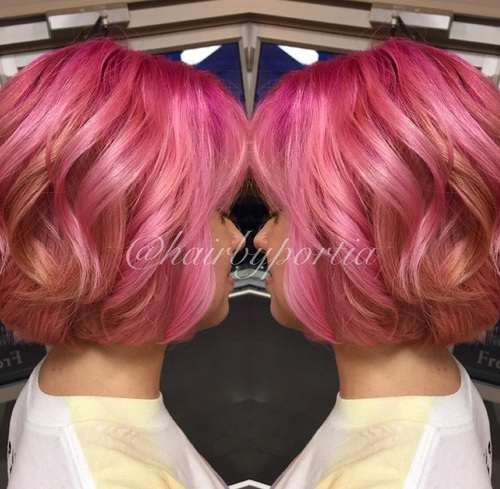 If you fancy a change to your hair then we couldn’t recommend a pop of pink more – especially because it is so on trend. 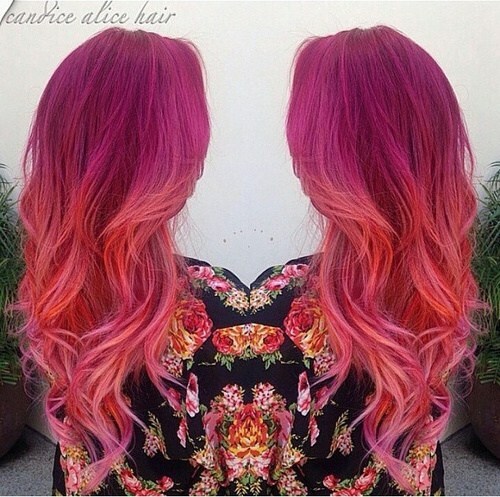 Let our gallery of the best pink ombre hair looks inspire you to take the plunge today! Why go for one pop of colour when you can have two? As this amazing lady has proved, sometimes two colours is better than one! 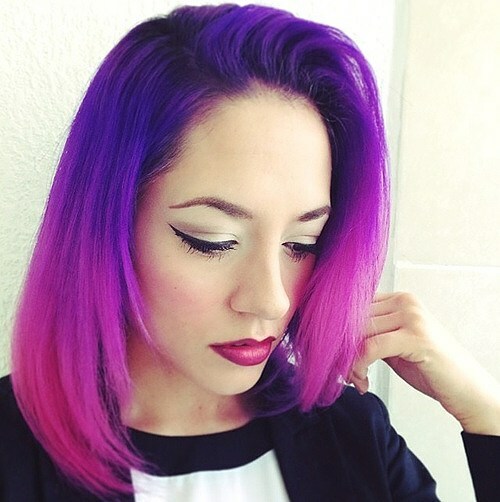 She’s finished her hot pink hair off with a vibrant ombre to a deep lavender purple on the ends, and the two colours couldn’t possibly match more perfect. Finished with big ringlets this style is very eye catching indeed. 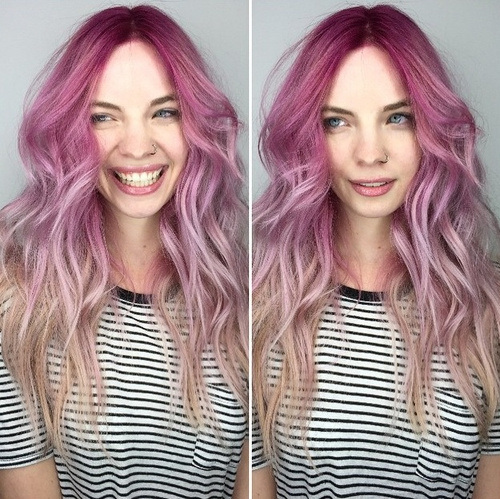 In what might be our favourite pink ombre transition of the bunch, this stunning pastel ombre look is the work of a truly remarkable hairdresser! Starting with a deep purple root and transitioning quickly to a bubblegum pink at the top of the hair, the ombre effect then ends up in a gorgeous deep pink at the end, perfectly highlighted by these barrel curls! This girls beautiful long and blonde hair is finished perfectly by a stunning ombre transition into a vibrant and bright pink at the ends. 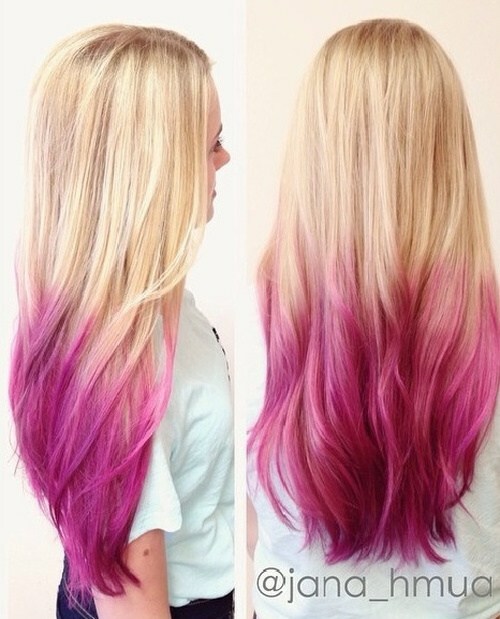 Her hair melts seamlessly from one colour to the other and creates a striking and beautiful visual effect! This girl’s left her long locks straight with a slight natural wave, but we think curls would look amazing too. This beautiful warm blonde highlighted hair works into a gorgeous dusty pink on the ends and we think the colour combination is just perfect. This impeccably stylish girl has softly curled her locks and gone for a gorgeous and messy fishtail braid for half of her hair, creating the perfect boho hair style that is just fantastic for festivals! From one beautiful and bright pink to another, this impeccably stylish and trend setting lady has gone for bold and bright with her pink ombre transition! 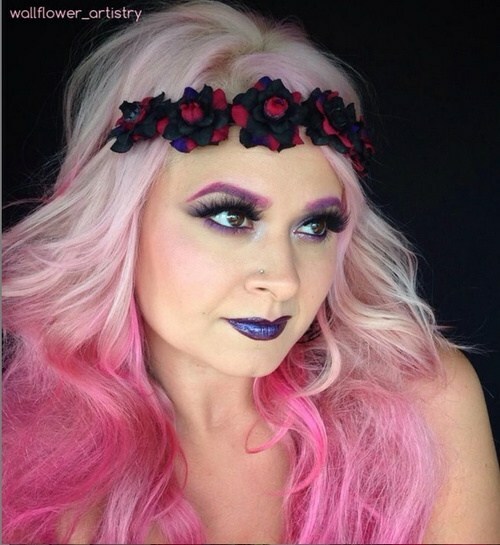 Going from a gorgeous hot pink at the root which transitions into a stunning more neon, lighter pink at the ends, this stunning pink hair is designed to attract attention. We love the loose curls! 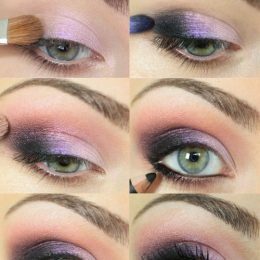 This gorgeous brown and pink combination is a sight for sore eyes – we just love it. This wonderful lady has finished off her deep chocolate brown locks with an ombre transition into a wonderful flamingo pink – and we think these two colours work together seamlessly. She’s gone for ringlets at the ends of the hair and we think it looks gorgeous. Why have one pastel colour in your hair when you can have several? 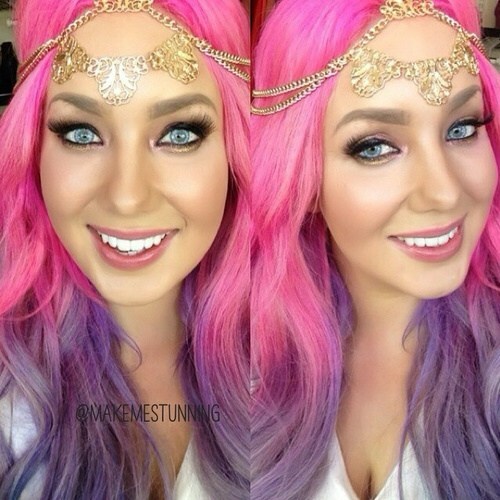 This lady is working pastel perfection with her stunning long locks and we just love it. From a beautiful light pink at the root, transitioned to a beautiful deep pink and lilac purple ombre at the ends, we think this curly hair looks simply stunning, don’t you agree? This fabulously stylish lady has finished her beautiful blonde curly hair off with an ombre melt into bright pink and purple ends and we think that it looks simply stunning! The combination of gorgeous bright colours looks wonderful – especially when finished with beautiful ringlets like this lady has gone for! 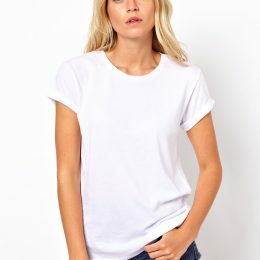 We think it would look equally great with straight hair too. This gorgeous white blonde hair is absolutely gorgeous with tight curls starting from the centre of the hair to finish off the ends, but this lady has gone one step further than curling her hair – she’s added a beautiful baby pink ombre transition to bring her hair to life, and we just love it! 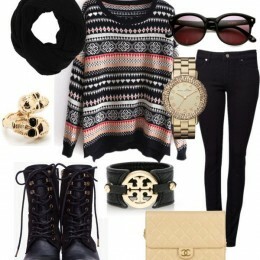 Effortlessly stylish and impeccably cool – Styles Weekly approves. 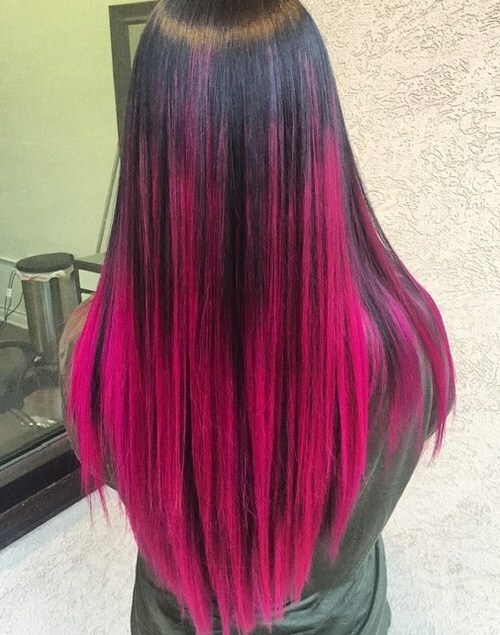 We’re starting our gallery with an incredibly striking cut, going from a gorgeous dark black into a vibrant hot pink ombre look! This lady’s long and straight locks perfectly compliment her stunning and vibrant hair – and we think it looks exceptional against her cool leather jacket too, don’t you? 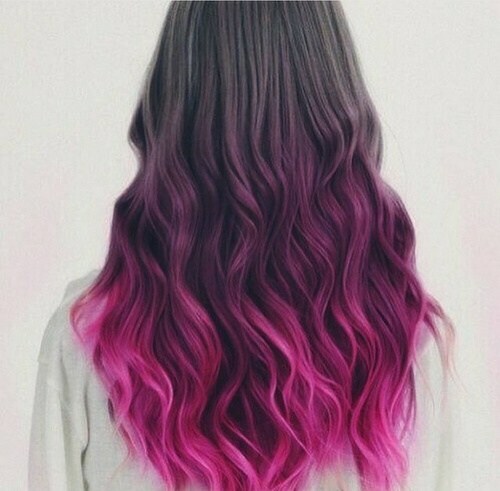 This would look equally amazing when curly. 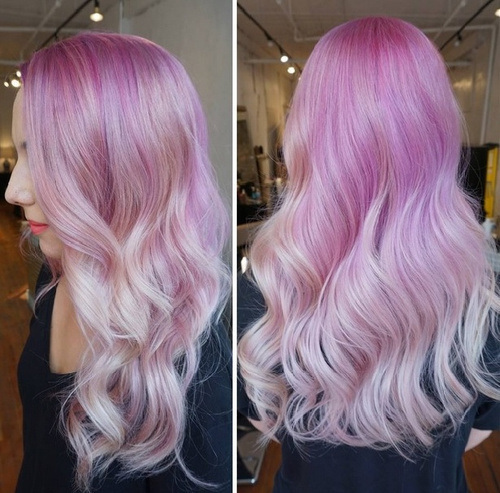 This bubblegum pink to purple ombre looks simply stunning, we’re sure you’ll agree. A combination of two beautiful pastel colours, the transition from one to the other is smooth but striking, and it looks amazing on this gorgeous girl! 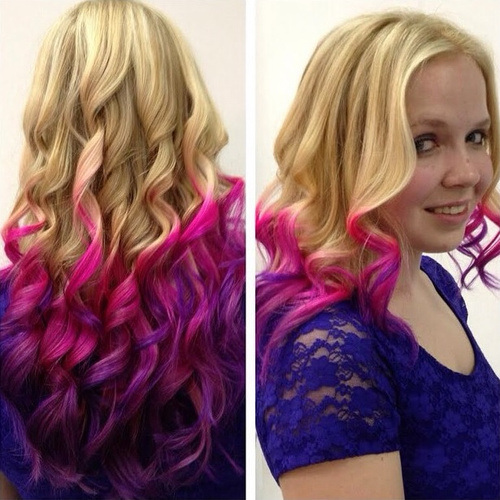 She’s gone for loose curls throughout the hair to show off the gorgeous colours working together and we just love it. 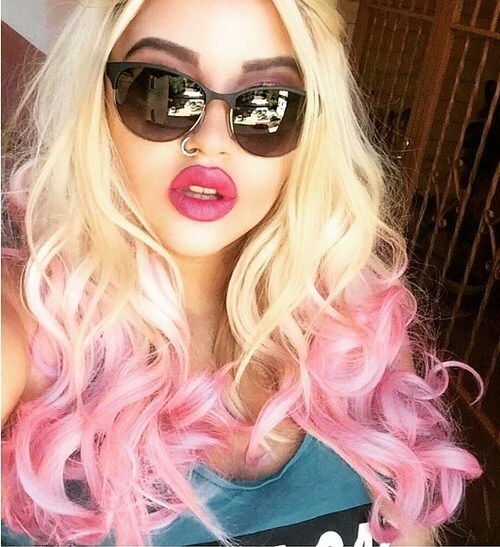 This white blonde to bubblegum pink gives us a nostalgic feeling and reminds us of Christina Aguilera in the 90s – which is in no way a bad thing! It’s a classic combination that has come back into fashion in a big way, and when you look at this stunning girl and her hair it’s no surprise why! She’s gone for big back combed curls and volume and we think she looks amazing. 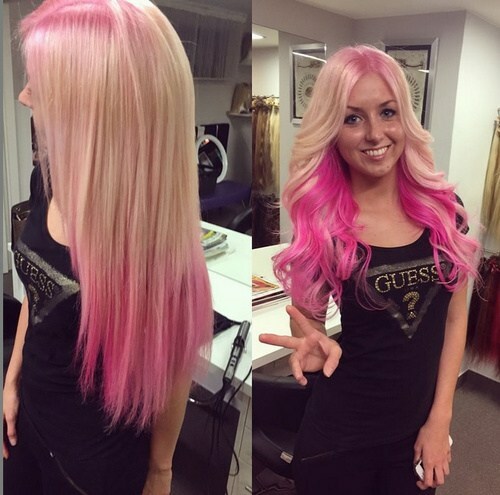 This stunning girl has gone for two different types of pink – a gorgeous and deep pink at the root transitioning into a stunning lighter pink at the ends of the hair in a gorgeous ombre effect. We absolutely love this colour combination and think how this lady has gone for soft curls throughout just works perfectly! The centre parting creates a gorgeous symmetrical look. This gorgeous chocolate brown hair is long, curly and quite striking – especially because it’s finished with an absolutely gorgeous pink colour on the ends! 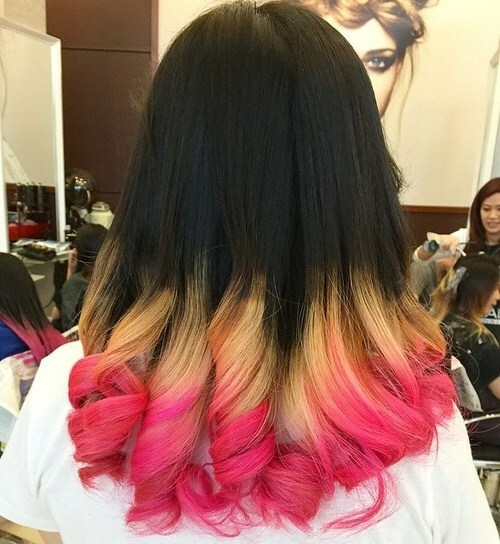 This lady has gone for a beautiful soft curl throughout, which makes this stunning ombre look even more beautiful. We think this hair would be just as perfect when straight too. This fabulous lady has gone for a slight twist on the ombre look – going from a bubblegum pink colour at the root and transitioning to a gorgeous blonde at the ends, this lady’s stunning ombre colour look works exceptionally well on this incredible crop! This gorgeous bob is brought to life with a bouncy curl and we just adore it, don’t you? This gorgeous and incredibly trendy girl has gone for a stunning colour combination for her pink ombre look – and we think it looks like she’s straight from the pages of a magazine! 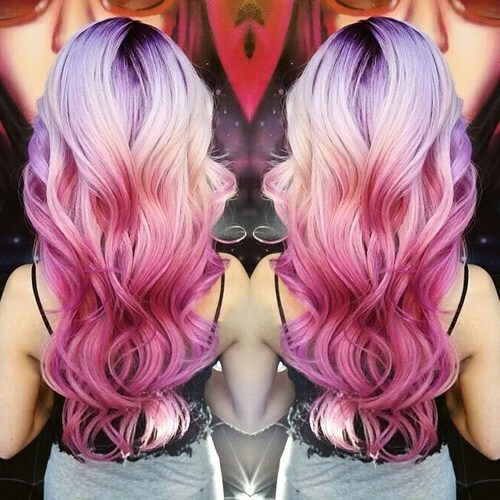 From a gorgeous purple root to a beautiful bright pink end, this sleek and straight hairstyle is curled under at the ends to create a stunning and sweeping silhouette. 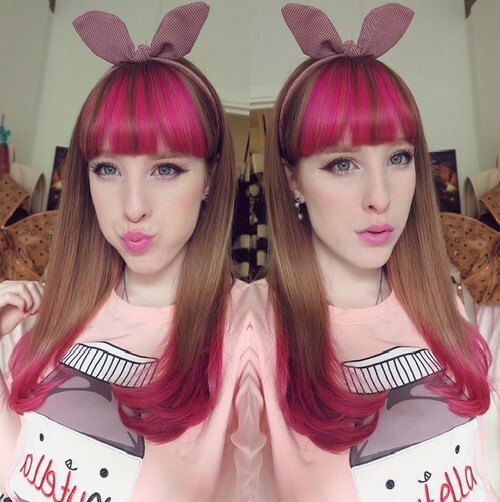 We absolutely adore this adorable lady’s fantastic hair combination! 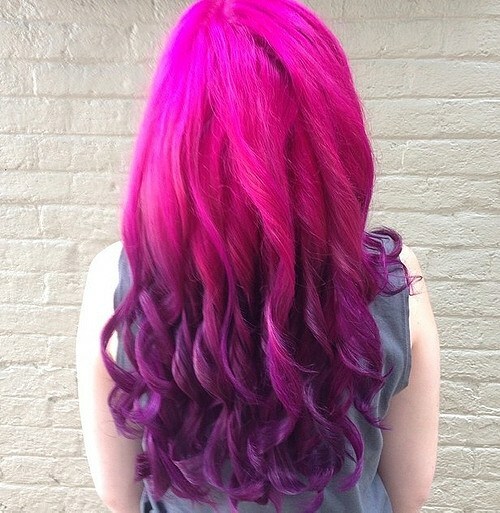 The primary colour of her hair is a beautiful auburn-toned brown, but she’s brought her gorgeous hair to life with a bright pink fringe and a stunning bright pin ombre towards the ends. She’s straightened her hair and curled the ends under for a beautiful finished effect. This gorgeous dark hair transitions from a wonderfully deep colour to a beautiful yellow-toned blonde and then a gorgeous hot pink right on the ends – and we think the three colours work together marvellously. This lady has finished her look with large barrel curls on the end to highlight the colours and we just adore the final look. Another one of our favourite looks from this stunning selection, this beautiful hair makes this stunning lady look like a mythical mermaid! Going from a gorgeous and soft pink with a slight hint of purple to a beautiful silver white at the ends, this stunning curly hair looks absolutely flawless – especially in the gorgeous loose waves she’s worked through it. Pink to Blonde to Pink Again! 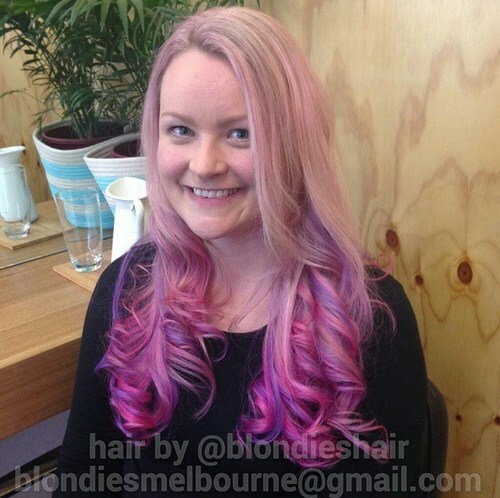 This gorgeous lady has gone for a double ombre effect with her pink and blonde locks and we love it! Starting with a pink root that works quickly to a gorgeous blonde tone and then finished off with the same hot pink at the ends, this stunning transition works wonders and you can really see the colours with her straight and sleek hair do! 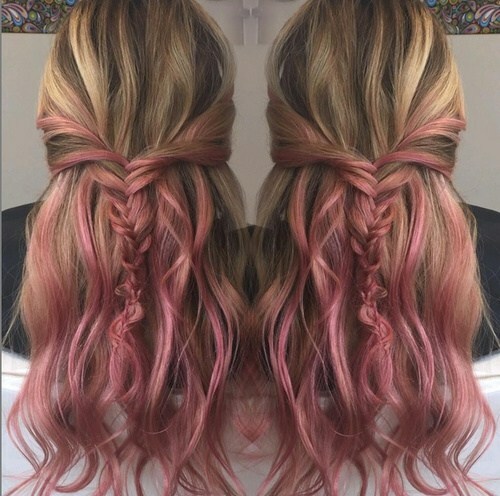 If you’ve never considered adding a pop of pink to your hair before, we hope this wonderful gallery has inspired you that pink is the perfect colour for your hair! 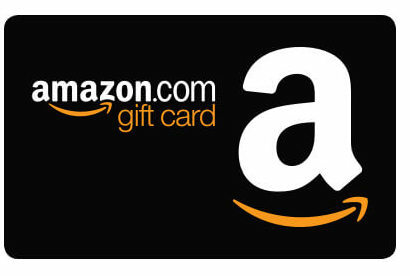 Styles Weekly has an impressive gathering or hair articles – so be sure to shop around.